Steel Skeletons in the Graveyard! 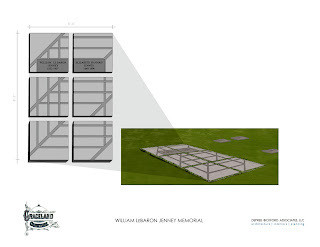 A new William LeBaron Jenney memorial to be unveiled in Chicago’s Graceland Cemetery. Jenny’s Home Insurance Building of 1884/5. I’ll have to see the Jenney memorial on site. It was designed by DePree Bickford Associates, LLC along with the Trustees of Graceland Cemetery. Bevel Granite Company of Merrionette Park, IL is the fabricator/installer. The dedication of this new memorial at Graceland Cemetery is scheduled for June 9th at 2:30PM. Following that, the Chicago Architecture Foundation will offer tours of Graceland. 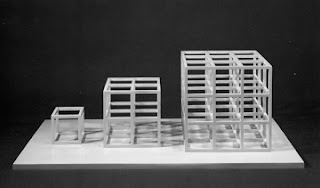 It’s Chicago’s Cemetery of Architects. Buried there are William LeBaron Jenney, Louis Sullivan, Daniel Burnham, Ludwig Mies van der Rohe, Bruce Goff, William Holabird, Fazlur Khan, Marion Mahony Griffin, John Wellborn Root and others. 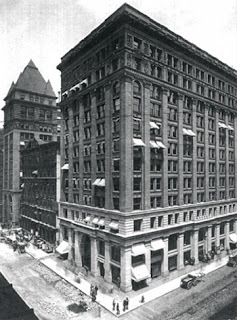 The New York Life Insurance Building on LaSalle in Chicago, 1894. Wait a minute! Appreciated? Just last year Preservation Chicago had New York Life on its Endangered List. A developer wanted to put a 50 story skyscraper on top of it! Learn more about the work of William LeBaron Jenney, “The Father of the Modern Skyscraper,” at the Chicago History Museum on the morning of June 9. If you were designing a memorial to him, how would it look? You are currently browsing the archives for the Graceland category.